The Indiana Talking Book and Braille Library often gets calls from patrons who just want “something good” or more books like a certain author. While we are able to rely on our ILS for a lot of Reader Advisory assistance, sometimes something more is needed to satisfy patron requests. Here are some tools we use to help us satisfy those types of requests, please share any of your favorites! The website http://www.genrify.com/ has a great and fun feature called the blender, which is both helpful and fun to play with. The blender will let you pick your “ingredients” from a list, mix them together, and then display the results. You can blend genres such as romance and horror together or historical and science fiction. 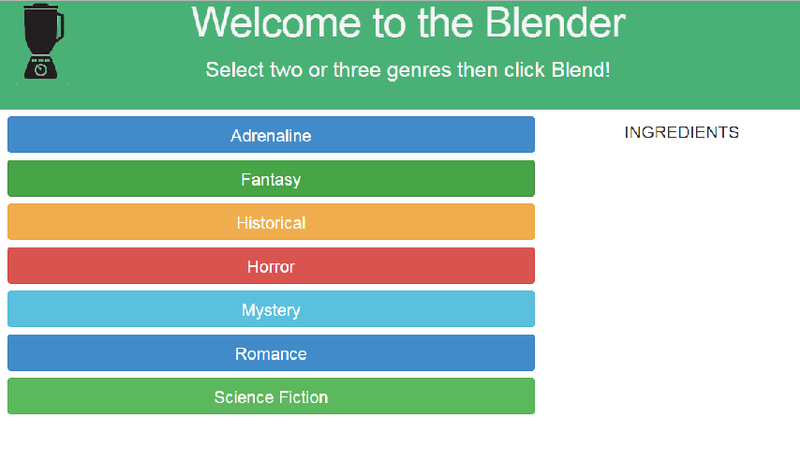 The results of the blender are displayed in an easy to read list with the book’s genres listed and links to amazon for more detailed reviews. This is a new discovery for me and I love playing with it. 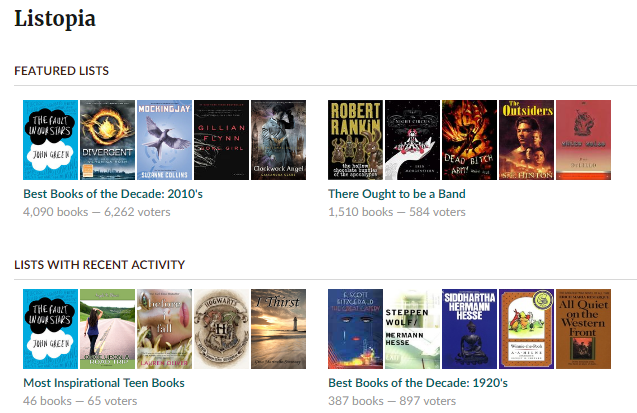 Goodreads is one of my favorite websites to visit for my own personal reading habits. I love that I can keep track of what I’ve read and that I can usually find interesting lists that can help me find what I want to read next. While some of their lists are silly (I recently read H is for Hawk and was then directed to a list of books with birds on the covers) there are a lot of great ones that can help you to find similar authors or books to what you have just read. We also use Goodreads a lot to help up put proper subject headings on our books. Literature Map is another Reader Advisory resource that I like playing with just to see what it will come up with. 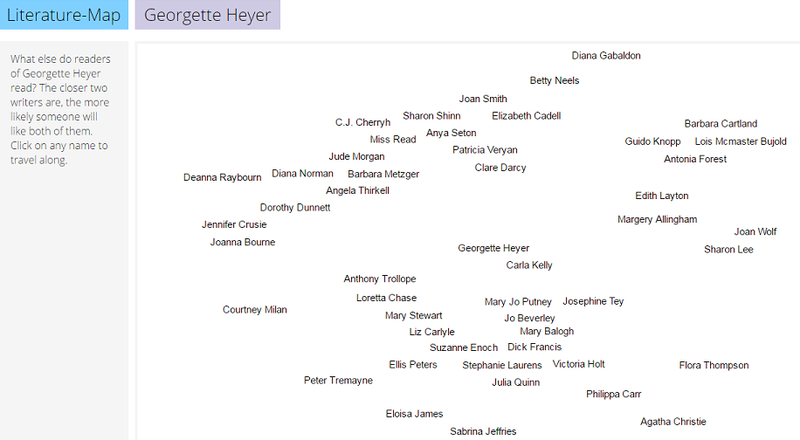 Literature Map allows you to type in the name of an author; it then creates a “map” with the most similar authors to the one you searched for displaying in the middle with results fanning out based on relevancy. This is a great resource to use for a patron who has read everything by their favorite author and is desperate to find a new but similar author to start reading.